Abstract : Many materials, such as milk or wax, exhibit scattering effects; incoming light enters the material and is scattered inside, giving a translucent aspect. These effects are computationally intensive as they require simulating a large number of events. Full computations are expensive, even with accelerating methods such as Virtual Ray Lights. We present a method to encode multiple scattering effects using a neural network. We replace the precomputed multiple scattering table with a trained neural network, with a cost of 6490 bytes (1623 floats). At runtime, the neural network is used to generate multiple scattering. 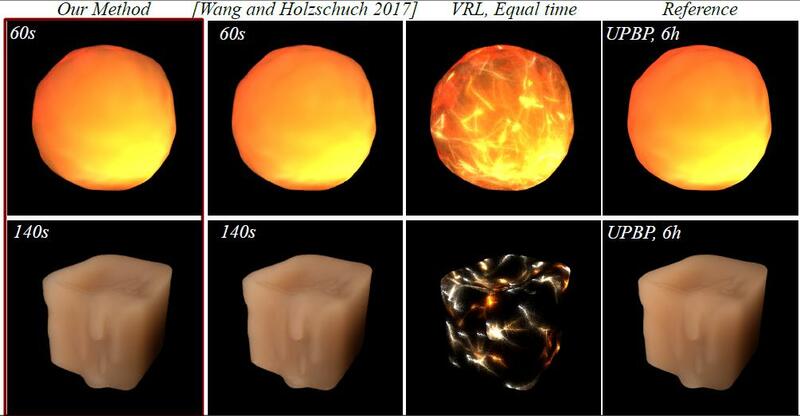 We demonstrate the effects combined with Virtual Ray Lights (VRL), but our approach can be integrated with other rendering algorithms.